It's been a week since we launched our Kickstarter project for Battle Tank: Escape From Giant Robot Island and we have gotten mostly positive feedback, but we are still far short of our goal and we can see a few things we should have done better. Luckily it isn't too late yet. In the beginning, we were really worried about the budget. It would be pretty terrible to fund and find out we couldn't deliver after all. But even still there are some things that need to get done and are worth the added expense so as of now we are working overtime to get those things added. Forget cardboard tokens; we're working on making custom, plastic miniatures. In the next few days we will discover if my sculpting and molding skills are still sharp. The sculpting will be relatively easy, a tank is mainly a block though the robot I've got right now looks sort of like a nefarious gingerbread man. Not just more levels, but more goals built right in. We have already planned several expansions for Battle Tank so we're going to add more information about them starting with Battle Tank: Assault on Laser Shark Lagoon. Whereas Escape From Giant Robot Island is all about running away, this expansion is all about taking the fight to the mad scientist's doorstep. This expansion introduces Dr. Aquaria Bublé, an expert in melding flesh and machine. Due to her lack of an imposing fortress she is easy to underestimate, but who needs a mountain when you can live beneath the waves, hidden by the majestic (and largely artillery proof) sea? Each new set will introduce a new mad scientist and the necessary tiles to construct their lair as well as introduce any new rules necessary to handle them. 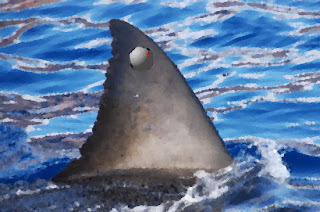 Laser Shark Lagoon, for example, introduces water as a major terrain feature as well as melee attacks from the fearsome metal jaws of the cybernetically augmented great whites favored by Dr. Bublé. Beyond these early sets there will come flying vehicles and monsters, submersibles, new terrain types and many other things that we hope will be as fun for you as they are for us.